That was the title of a presentation I gave a few days ago at the Lansing Chapter of the Institute of Internal Auditors. 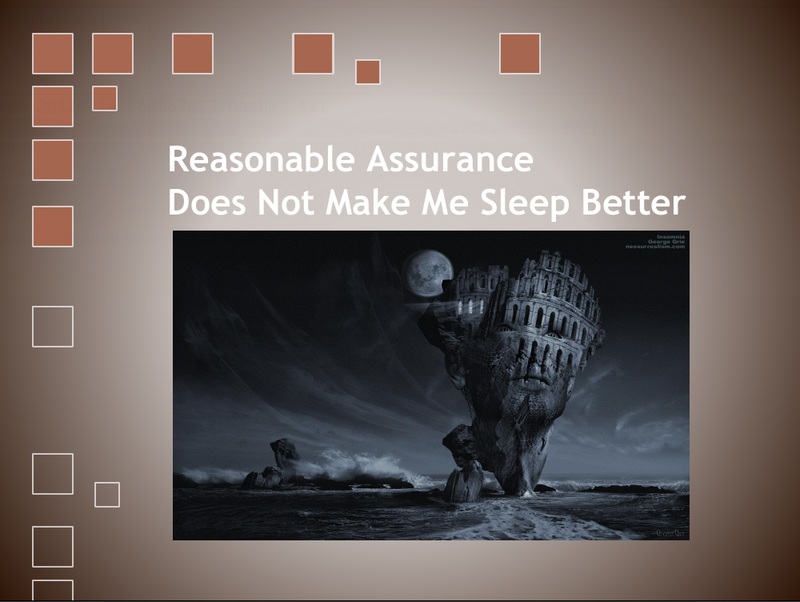 The idea for the theme came to me because I continue to hear the phrase "reasonable assurance" applied in several ways to audit work. It just struck me that any audit of information technology security performed to a level of reasonable assurance does not make me feel any better about the actual security of the system. Our adversaries are not "reasonable" in the lengths to which they will go to abuse the systems that we as IT professionals have worked so hard to build. Business customers and citizens interacting with government just want functionality to be able to get a product, a service or communicate with the organization. But, because that's where the money is, criminals prefer to see these systems and applications as opportunities to steal money or proprietary information, embarrass the organization or bring them down. If auditors are just trying to ensure that management has done a reasonably good job at implementing reasonable controls that are reasonably effective, we're sunk. Of course, it's not the job of Audit to identify every vulnerability. Audit is considered a third line of defense. Stakeholders might believe Audit has their backs covered, but that's a different problem. Audit is responsible to ensure stakeholders understand the true risk so that risk can be accepted, mitigated or transferred. I believe this effort too often fails and I hope this presentation is useful in providing a perspective that may make it easier to achieve that limited goal. If you go to my Downloads page, you'll be able to compare the sha1 checksum. All content, unless otherwise noted, is copyright by Melvin Drews. All rights reserved.. Awesome Inc. theme. Powered by Blogger.